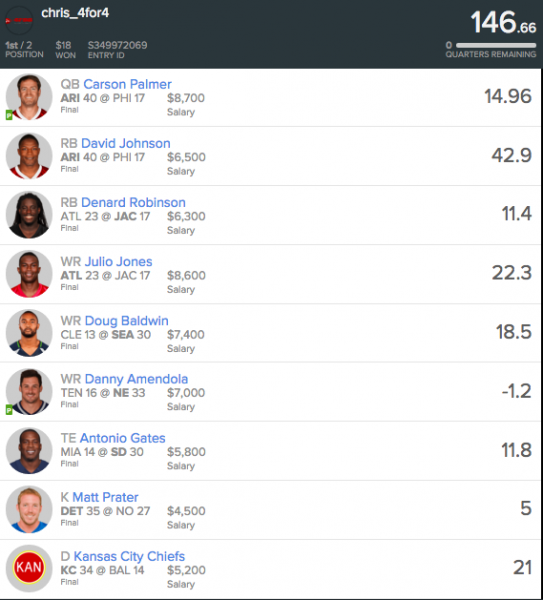 Week 15 was tilting, as I made some last minute adjustments to the lineup I wrote up in the Week 15 Cash Game Breakdown, which cost me a bunch of points. I essentially swapped out Russell Wilson, Michael Floyd, and Greg Olsen for Carson Palmer, Danny Amendola, and Antonio Gates. Amendola caught a pass, fumbled, and got injured, leaving me with an ugly -1.2 in an otherwise decent lineup. Week 15 serves as a reminder of why playing all 50/50s or double ups is riskier than playing the majority of your action in head-to-heads. I put my usual 80% of cash game money in play in head-to-heads, and turned a small profit in head-to-heads. However, I just missed the cutoff in double ups, which could have produced a disastrous week had I allocated all of my money in pay to double ups (although I would have probably made the cut-off in 50/50s). 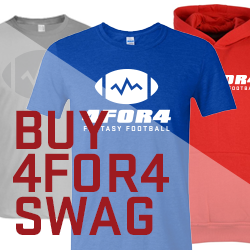 I didn't connect on many GPPs this week, and that combined with failing to reach the cut-off in double ups left me without a Week 15 profit overall as the bankroll dropped to $1,730. 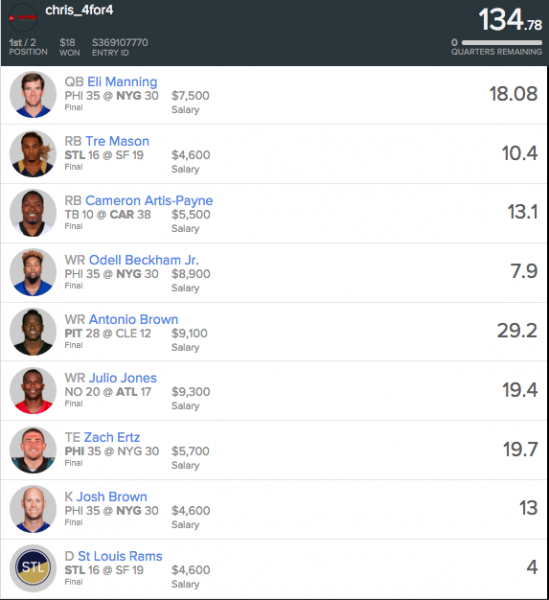 I rebounded nicely in Week 16, making back the money I lost the prior week and then some. The main factor in my success was having more exposure than most to DeAngelo Williams in cash games. I thought Williams was neck-and-neck with David Johnson as the top cash game play (he was averaging 120 yards and 1 TD per game -- LeVeon Bell numbers), but Williams was only owned roughly half as much as Johnson. Behind Williams' strong game, I went 83-29 in head-to-heads and finished in roughly the 77th percentile in double ups. 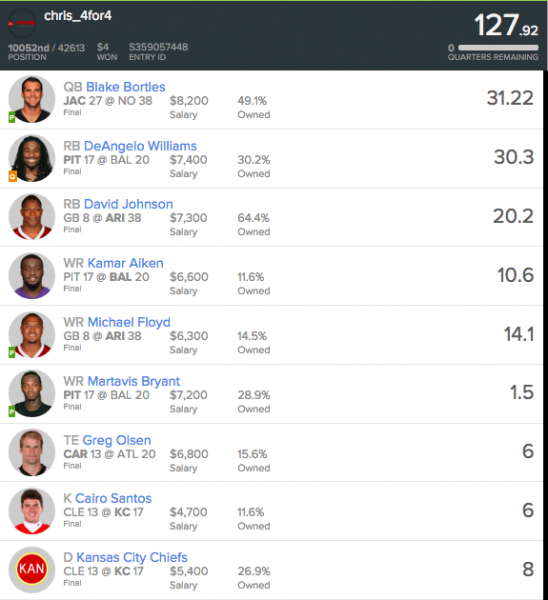 In Week 17, I played a lot more conservatively in terms of money in play. I put only 10% in play and split that evenly between cash games and GPPs, and I played no double ups, only head-to-heads. In retrospect, I should have played more cash games, as I went 59-4 in head-to-heads, which is where most of my Week 17 profit came from. In GPPs, I was a few dollars from breaking even. Still, the strong head-to-head showing allowed me another profitable week, and the bankroll is at its highest point yet.